3-13-19 REDUCED an another $100,000!! SELLER WANTS AN OFFER!! 2-story LUXURY condominium located in the exclusive GATED community of Sanctuary By The Sea. This unit features 5-bedrooms, 5-baths plus a media/theater room, with 4,511 SF of interior living space and 680 SF of outdoor living space on 2 separate levels and a beautiful DIRECT OCEAN FRONT VIEW looking south over spectacular dunes and Big Redfish Lake. Interior features include: NEW travertine flooring added throughout in spring 2015, 10' ceilings, wide crown molding, 7'' base moldings, 8' doors, gas fireplace, wet bar, tiled balconies, elegant master baths with whirlpool tub and separate shower. The kitchen is a CHEF's DREAM with 3cm granite countertops and CUSTOM cabinets that showcase high-end VIKING appliancesincluding a GAS stove. 4 king master suites, a kids room that can sleep 7 with a full-over-full and a twin-over-twin bunk bed which also have trundle beds beneath). The condo is 2 floors with 2 separate entrances. The first floor is situated at 27 feet of elevation, looking through and over the lake preserve towards the dunes and beach in the distance, and includes the living, dining, kitchen, bar entertainment area, and 2 king bedroom suites with private ensuite bath and walk in closet. The second floor is at nearly 40 feet of elevation and includes the huge and luxurious master suite which occupies about half of the second floor, and is appointed with a large king bed, a living area with gorgeous south view, desk, beautifully furnished private balcony, large walk-in closet, and huge master bath. Also on the second floor is the 4th King suite, kid's room, and the media room. Very convenient underground parking is directly adjacent to elevators up to the unit. Sanctuary By The Sea is unique due to the EXQUISITE amenities featuring: 3 large pools, whirlpool spas, gas fire pits, & grilling areas, optional poolside cabanas, Owners' Club with a large fitness center, virtual golf room, family theater, video game area, meeting and conference facilities. Sanctuary by the Sea is a gated community that offers unparalleled privacy with only 82 condominiums. These residences are situated on 23 secluded acres with 650' of beach frontage on the Gulf and nestled next to a rare coastal dune lake and private nature preserve. The lake provides activities such as kayaking, fishing, and standup paddle boarding. Centrally located to the best dining, unique boutique shopping, bike paths and some of the most challenging golf courses the gulf coast has to offer. 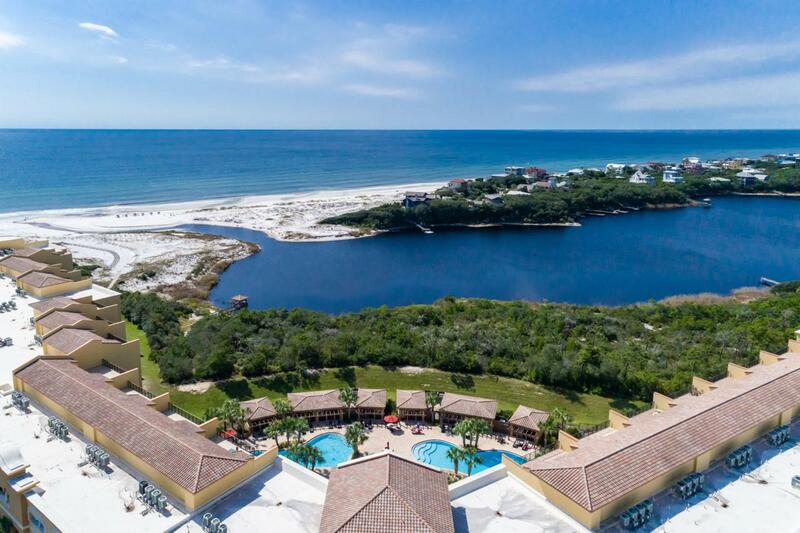 Easy access to Hwy 98, allowing you to explore the nearby cities of Destin or Panama City Beach, as well as, the Northwest Florida Beaches International Airport. Condo sold fully furnished to INCLUDE a KAYAK AND STANDUP PADDLE BOARD. Buyer to verify all information and dimensions.